Mt. Bisoke is one of the eight volcanoes in the Virunga mountains range of the albertine Rift, the western part of east African rift. It bestrides the border of Rwanda and the Democratic Republic of Congo (DRC), it also bestrides two bordering national parks, which are Volcanoes National parks of Rwanda and Virunga national park of Democratic republic of Congo. However the bigger part of Bisoke volcano including its summit found in Rwanda. The name Bisoke came from these two crater lakes that the local people named the mountain “Bisoke” meaning soaked with water. 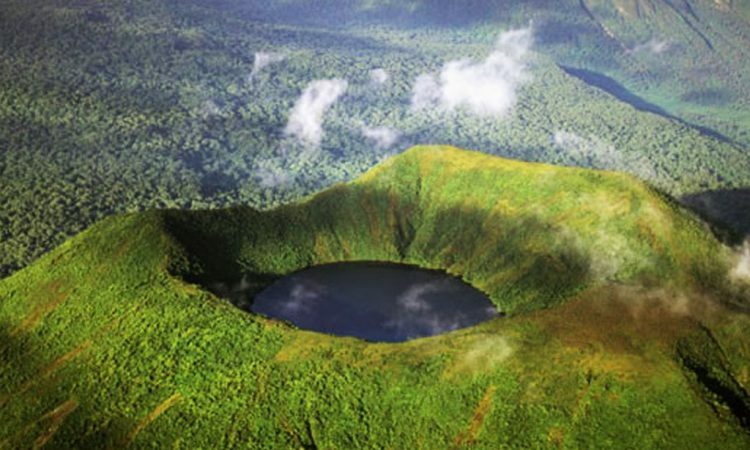 The summit of mount Bisoke has a beautiful crater lake of about 400m of diameter, and other crater lake of Ngezi of about 11km from the summit, these crater lakes and the height of Bisoke Mountain is 3,711m formed after its last eruption in 1957. The summit does not gather snow, but is covered with fog. Like all the peaks in the virunga mountain range, Bisoke is a volcano created by rift action on the forming divergent boundary of the east African rift, which is slowly cutting across the African tectonic plate. Apart from visitors to the parks searching for gorillas or other wildlife animals, the peak is popular with mountain climbers. It can be climbed in a day from Rwandan side, and the Rwanda development board (RDB) leads two day excursions to it and nearby Mt. Karisimbi, most often out of the nearby city of Musanze. The climb is considered steep, but walkable, the volcano has two major hiking trails, each one leading to one of the crater lakes. The most popular trail is the one leading to the Crater Lake at the summit; it is a 6hours hike depends on the speed of climbers, which consists of 4hours of ascending to the summit and 2hours of descending from the summit. The second trail is the one leading to the second Crater Lake of Ngezi, this is much shorter, and takes only 3hours hike, with 2hours to the Crater Lake and 1hour back. Both are 1day hike, it is easier that even a beginner can take on, but it demands extra strength and good health status. The hike also offers the opportunity of encountering Mountain gorillas, tracking the Golden monkey within a range of mountain scenery. Park fees for the climb are $75 USD per person including the park guide taken from the volcanoes national park’s head quarter in Kinigi, you can also hire a porter from the park’s headquarter for $20 USD, climber can buy a wooden stick in the nearby artistic shops. The trek starts at 07:00 pm from parks headquarter in kinigi where the visitors pay for climbing permits. In Mount Bisoke there is also Dian fossey tomb site, a tomb site of an American Wildlife researcher and renowned Primatologist who dedicated her life for conserving the mountain gorillas against the poachers, she was also known as “Nyiramacibiri”. Mount Bisoke consists of different vegetation habitat starting with Bamboo forests, then moving to Hagenia- hypericum forest and the Senecio-lobelia bush near the summit. In this years, both parks are secured and the tourism industry is recovering, despite the insecurity that took a place in both countries suchlike; Rwandan liberation war (1990-1994), Genocide against Tutsi (1994), first (1996-1997) and second (1998-2003) Congo wars, during that time of wars, military action and refugee relocation destroyed the ecology by deforestation and poaching of endangered species, upon the Volcanoes National Park of Rwanda and Virunga National Park of Democratic Republic of Congo, and even the surrounding areas.